Our company was established in 1889 (Meiji 22) at Katsushika, Tokyo. By utilizing the rich-water from Nakagawa and Arakawa river, the company “Marusansome” was established as a manufacturer of small size bleached cotton cloth, known as ‘Sarashi’. ‘Handako’ and ‘Yukata’ were used to be casual clothing at that time (Handako is cotton shorts, Yukata is summer kimono). Mikawa momen (Mikawa cotton cloth) and Mouka momen (Mouka cotton cloth) were used and dyed at dyeing factory in Kusaka area. After “Takizawa Hyohaku Koujyou” (Takizawa bleach factory) in prewar, “Tokyo Wazarashi Yugen Gaisha” (Tokyo Wazarashi limited company) was started. The demand of ‘Yukata’ increased gradually in the world of geisha after the war, it reached the peak period in around 1954 (Showa 29) and its industrialization really started to progress. Reorganization from Private Limited Company to Corporation. By making the best use of the geographical condition and facilities, plain color dyeing, material arrangement, and texture process were started. During the decrease of local production of ‘Yukata’, it moved into the Western clothing field. A full operation of the production of original ‘Tenugui’*, ‘Hanten’**, ‘Noren’ *** and other products has started based on order received through internet. *Tenugui – Tenugui is a type of traditional Japanese hand towel made from bleached thin cotton cloth with the size of about 35 cm wide x 90 cm long. **Hanten – Hanten is a Japanese short coat and known as a part of Kimono. ***Noren – Noren is a type of shop curtain. Main factory (Plain color dyeing/arrangement section) was closed. ‘Asakusa Omatsuri Musium’ was opened at Daito-ku Kaminarimon 2-chome. 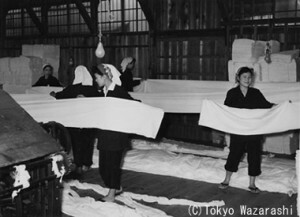 Tokyo ‘Wazarashi Souzou Kan’ was opened as a base of new ‘Culture of making Tenugui’. We have a project management to attract more people to be interested in ‘Chusen-Tenugui’ such as Experience in Dyeing Tenugui *’ and ‘Toyota Collection**’. ** Toyota Collection –Toyota Collection of Tenugui is known as one of the best collection in the world, in terms of both quality and quantity.